Feature 3: Long Lasting more than 12 hours. 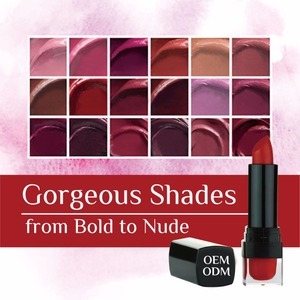 We have shinning colors and purely matte colors for you. We are sure that our factory meet the high grade standards. The River Yoshii, a clear stream flows in the neighborhood and we use the water for manufacture. Comprehensive business support from product planning and development to manufacturing. Formulation Formulation can be adjusted for the specific regulation for the market and for your needs. 3. We can also make this set with eyeshadow crayon formula, or develop customer's own colors. 2. We can supply complete range of cosmetics for lips, eyes, faces and nails, as well as related accessories. All of our products and materials are tested by SGS according to the standard of different market. The long lasting matte lipstick bullet is shaped to sculpt the curves of your lips. 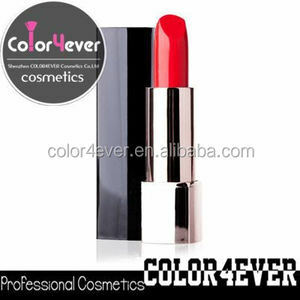 This matte lipstick is long lasting for more than 8 hours with popular fashion pop color. As well, the cosmetic manufacturing facilities are the best management system through regular inspection. Our product receives strong trust from great number of our customers, and this is our pride. Our Factory We are very selective about our use of water which is the most important element for cosmetics. And we are receiving high evaluation on our product quality and ability of proposing creative ideas from the world. Therefore it is a very safe and healthy ingredient for humankind. Germanium has bipolarized ion which neutralize active oxygen to prevent the skin from oxidization. 2. Makeup and foundation are dissolved then wash off with worm water. We process with cold press method and we have carefully carefully extracted at a low temperature of 40 &#8451;. 2)Adopt fermentation separating process When separating oil, water and others, general coconut oil companies use machines (was separated using the machine, how to taste and nutrition falls) . However we adapt traditional fermentation separation method (without machine, about three days employs a carefully wait method for separating), and finished in coconut oil that you can enjoy the original flavor and nutrients of coconut. Alibaba.com offers 2,666 japan brand cosmetics products. About 23% of these are face cream & lotion, 10% are skin care serum, and 8% are face mask. A wide variety of japan brand cosmetics options are available to you, such as lipstick, eye shadow, and lip gloss. You can also choose from lips, eye, and body. As well as from stick, liquid, and powder. And whether japan brand cosmetics is mineral, chemical, or herbal. There are 2,512 japan brand cosmetics suppliers, mainly located in Asia. The top supplying countries are Japan, China (Mainland), and Pakistan, which supply 50%, 45%, and 2% of japan brand cosmetics respectively. Japan brand cosmetics products are most popular in Southeast Asia, South Asia, and Eastern Asia. You can ensure product safety by selecting from certified suppliers, including 135 with Other, 85 with ISO9001, and 59 with GMP certification.